Everything you ever wanted to know (and a few things you didn’t) about volunteering in Cambodia! Every year thousands of well-intentioned foreigners come to Cambodia to volunteer. A few days of volunteer work have become as de rigueur for visitors to Cambodia as visiting the temples of Angkor. As a result, volunteering has become a full-fledged industry here and, lately, the subject of a lot of negative press. Most volunteers choose to work with Cambodian children, usually by teaching English in orphanages. 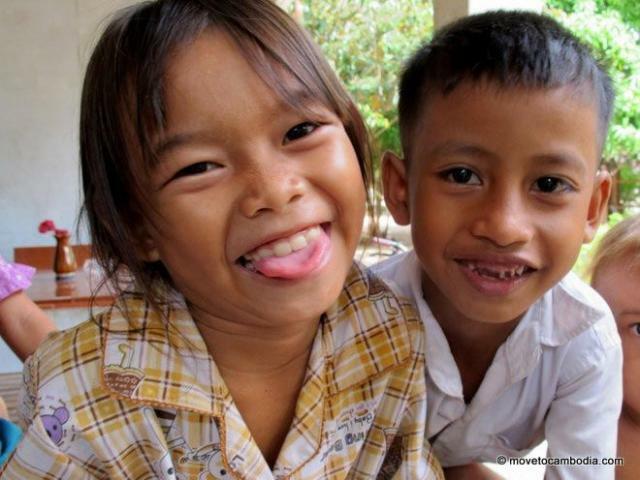 Be aware, though, that these Cambodian orphanages exist only to cater to foreign tourists. In fact, the vast majority of children who are placed in orphanages in Cambodia are not orphans and have at least one living parent. But demand from foreign tourists to visit Cambodian orphanages and work with Cambodian children is so high that parents are often offered powerful financial incentives to place their children in these so-called orphanages, or are promised that they will be provided with a great education, which is often not the case. No Cambodian orphans were used in the production of this photograph. Yes, this means just what you think it does: Cambodian kids are being taken out of their homes in order to give foreigners the chance to post photos of themselves hanging out with Cambodian orphans on Facebook. Children are being kept out of school so that they can instead learn to dance and put on orphan dance performances on the streets of Siem Reap. Pretty grim, eh? Understandably, all those Western volunteers would like to believe that they are different, that the work they are doing does not harm Cambodian children. Unfortunately, they’re wrong. If you want to work with children in Cambodia, first ask yourself if you are qualified to work with children at home. Most Westerners would be horrified at the idea of dozens of Cambodians flooding their child’s classroom each year–especially if said Cambodians had no qualifications to teach, had no teaching experience, underwent no background checks, and proceeded to post photos of the children all over Facebook. If you can’t imagine a school in your home country allowing that, I’m sure you can understand why many feel that it’s not appropriate for Cambodian children, either. Unless you have a very specific skill set, there is almost no volunteer work in Cambodia that you can effectively do if you’re here less than three months. Most reputable organizations no longer accept volunteers who are not willing to stay for at least 3 or 6 or sometimes 12 months. Think about it: students don’t learn English when their teachers are coming in and out for two-week stints.They learn the same things–like the alphabet and how to count to ten–over and over again, but never get a deeper understanding of the language. Imagine if your whole childhood education had been in the hands of short-term substitute teachers. Many of the schools and “orphanages” that use volunteers do so to avoid having to pay for permanent teachers. More generally, organizations that welcome short-term volunteers are all too often in it only for the money. Which brings us to the money. Many organizations that charge you to volunteer with children are highly suspect and often do not have the best interests of the children in mind. Organizations that do not require background checks most definitely do not have the best interests of children in mind. It’s important to remember that most work that you can do in Cambodia could be done as well or better by a Cambodian. Building houses and teaching may be eye-opening experiences for the volunteers, but there is no shortage of Cambodian workers and these volunteer positions can take badly needed jobs away from Cambodians. By now it’s becoming widely recognized that short-term volunteering is not an effective solution to Cambodia’s problems and in fact may do more harm than good. However, there are many long-term volunteering programs that are highly regarded. 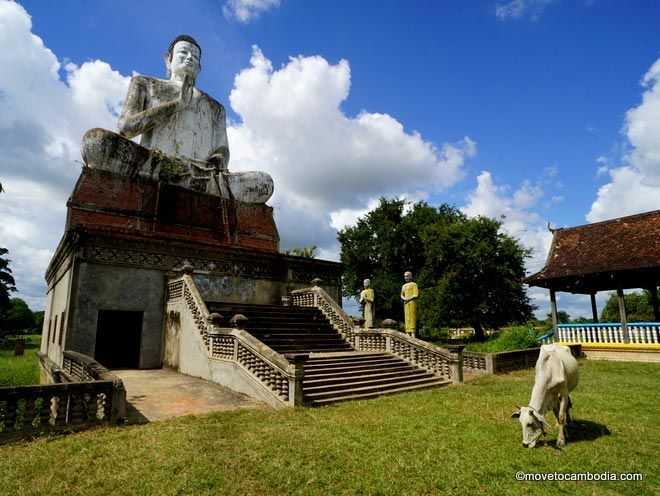 If you’re still intent on visiting for the short term, check out PEPY Tours. They offer educational bicycle trips and other tours that help visitors learn about the complexity of development work. If you’d like to learn more about responsible volunteering and tourism in Cambodia, Friends International, Cambodia’s leading child-safety organization, has plenty of information on the topic on their When Children Become Tourist Attractions site. 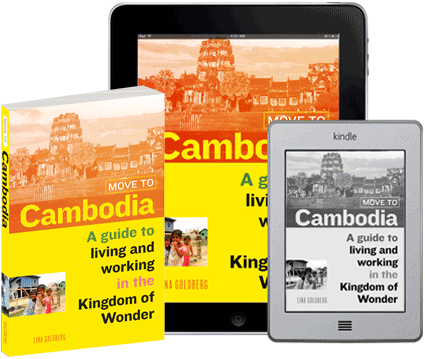 Daniela Papi, founder of PEPY, an educational development NGO, has written extensively about voluntourism in Cambodia on her blog, Lessons I Learned. Learning Service: Tips for Learning Before Helping is a good place to start for those considering volunteering. She’s also written a great article about volunteering in Cambodia that wanna-be volunteers would do well to read, “Voluntourism: What can go wrong when trying to do right?” Hear more from Daniela in the sidebar on this page. Is there any way for people to volunteer responsibly in Cambodia? Travelers looking to ‘help’ in Cambodia, or anywhere they don’t know well, should remember the most important lessons I learned during six years in Cambodia: We have to learn before we can help. If we skip over the learning part and are driven by our sympathy, we can often cause more harm than good: working for a corrupt organization, investing time and energy in efforts that perpetuate rather than counter poverty, etc. If we want to lead with empathy, rather than sympathy, we need to be able to put ourselves in someone else’s shoes. And in order to do that, we have to know them, their culture, their history, and have a view into the long-term impacts of our work. So we should travel to learn first. But can people volunteer responsibly? Of course! The problem is, people usually don’t go abroad to volunteer with a goal of maximizing their impact. Understandably, they usually also want to have fun, so oftentimes they want to do something active–paint something, build something, or play with kids–rather than less ‘fun’ work. If you are an accountant, there are probably tons of NGOs who need to understand accounting and tax law practices in your country, if it is a source of their donations. Or if you are a web or graphic designer, there are always tons of people who would want your help. The best matches will be ones where an organization has identified a need and is looking to have someone fill that role as a training position for a more full-time staff person, and where the volunteer applies to fill the role with the specific skills necessary. How can someone figure out if the organization they want to volunteer with is a reputable one? Once again, making the choice of where to give our time requires us to learn first. It requires us to do some work. You can’t just go online and see which ones are ‘great’ organizations, as unfortunately in international aid the beneficiaries themselves rarely get a chance to directly voice their feedback (and reviews from other donors or volunteers are not what you should be looking for). Ask people online, such as others you are connected to in that sector or who are working in that country, and ask the organizations themselves for feedback. Any organization that will not engage you in discussions about their own weaknesses or areas of growth, or that is willing to put you in a volunteer position that you are not qualified for, is probably not one you want to be giving your time to. Why shouldn’t I volunteer with kids? And what’s wrong with volunteering at orphanages? A recent UNICEF report showed that 76 percent of Cambodian ‘orphans’ living in orphanages have one or more living parents. Actually, the number of true orphans has gone down, but the rate of orphanage growth has risen with the growth of the tourism sector. Any orphanage that will let you in off the street for a day or a week without requiring background checks or without requiring that you are qualified for a specific role is not one at which you should be volunteering. Many orphanages in Cambodia are businesses. They will ask you to take a ‘free visit to our orphanage’ and then tell you tales of poverty. These institutions are separating kids who have parents from their families and communities, oftentimes for their own financial gain. I’ve done this kind of volunteering myself, and I’ve learned from watching the negative impacts of this harmful practice grow: a volunteer visit to an orphanage might be a feel-good experience for a traveler, but it is an immensely damaging practice for the families of Cambodia. Don’t do it.